Pack these stackable beauties and set sail on your next island adventure. 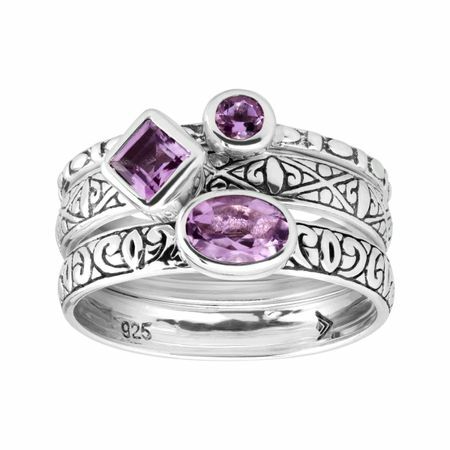 Natural amethysts, in a variety of cuts, are set atop three intricately-engraved sterling silver bands, perfect for wearing alone or stacked for a bolder look. Ring face measures 7/16 inches in width stacked. This piece is part of our Balinese Collection, inspired by the beauty of Southeast Asia and handmade in Bali using ancient silversmith techniques.